After assessing your child’s needs, the council must then decide whether it’s necessary to provide support to meet those needs – many councils use ‘eligibility criteria’ to help them reach this decision. Eligibility criteria can seem very technical and confusing – it’s important to remember that they’re just a way of measuring the impact on your child of not getting support. The more serious the consequences to your family, the greater the council’s responsibility to provide support. The support provided by the council must meet the need: this means that the services must be of sufficient quality, must match the needs of your child/your family and the staff must have the necessary skills and training etc. Gather any letters, reports or other documents which explain what will happen if you don’t get the help you need – ask the professionals involved with your family, e.g. your G.P, consultants, therapists, teachers etc. 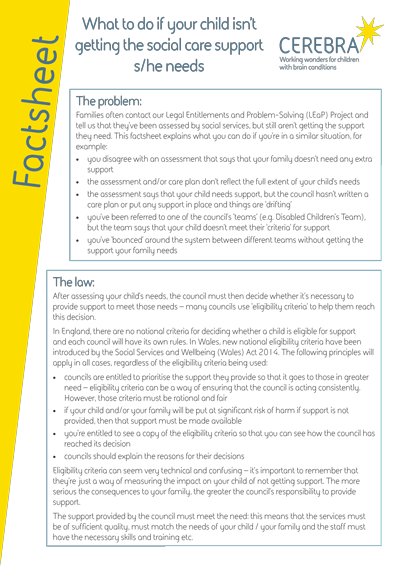 Use our template letter to explain the consequences to your family of not getting support and to ask the council to confirm the reasons for its decisions in writing. There are separate letters for England and Wales. Every council must have (and publicise) a process for dealing with complaints about children’s social care. If you’re unhappy with the council’s response, you can make a complaint. Our Accessing Public Services Toolkit has more information and template letters.